Why is Arby’s Called Arby’s? Truly, there’s no place like Arby’s. It’s definitely American, but its menu isn’t really typical of any specific region. It’s not a regular burger-and-fries chain like McDonald’s or Burger King. Arby’s is a sandwich chain, but it doesn’t sell submarine sandwiches like Subway or Quizno’s. Arby’s is uniquely positioned and doesn’t really have a comparable competitor. Arby’s place in the fast-food industry isn’t so obvious by looking at their curly fries, roast beef sandwiches and Jamocha shakes alone. From the beginning, their menu and image were rather unique. However, Arby’s has managed to establish a firm identity for itself in recent years with strong, bold, deep-voiced tagline and campaign, “Arby’s: We Have the Meats,” after years of an identity crisis and slumping sales. What do a Greek gyro, a reuben, a Philly cheesesteak, chicken cordon bleu, an elk sandwich and an Italian sub all have in common? Meat of some sort. It works! Why is it Called Arby’s? I had never given much thought to the name Arby’s. 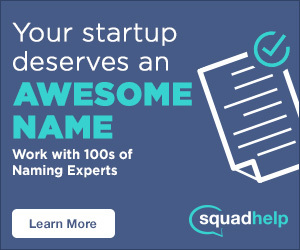 Like Wendy’s or Denny’s, I just figured it was the first name of a founder or someone the founder knew well. Then one day, I was scrolling through Twitter and read something crazy: the name Arby’s comes from RB, which stands for Roast Beef. I was amazed that I’d never realized that before! Now, I’m less amazed, because I just learned that that’s not the real story. Who knew Twitter could be unreliable? 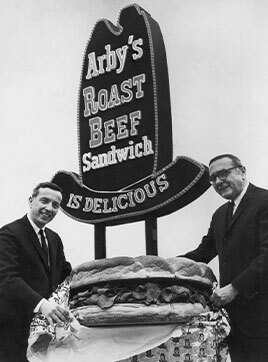 Arby’s was founded in Boardman, Ohio in 1964 by Forrest and Leroy Raffel. They owned a restaurant equipment business and thought there might be a strong market demand for a fast food franchise based on a food other than hamburgers. Initially, they wanted to name their new restaurants “Big Tex” though they weren’t in Texas and didn’t serve particularly Southwestern food. They then learned that name was already in use by another Ohio business, so they went with Arby’s instead. The name Arby’s came from the initials R.B. – which stood for Raffel Brothers. Initially, Arby’s served only their classic roast beef sandwiches, potato chips, and soft drinks. Arby’s interior design was more luxurious than typical fast food stands of the day, in hopes that they would attract a more upscale clientele. They sold their roast beef sandwiches for $0.69 – dirt cheap for today’s prices, but rather expensive at a time when a hamburger cost only $0.15! Their sign was shaped like a giant hat, just like it still is today, though their logo was slightly redesigned in 1975. It’s stayed the same since then. Arby’s quickly expanded in the following years and created several of their now-classic menu items, including the Beef ‘n Cheddar, Jamocha Shakes, Curly Fries, Arby’s Sauce and Horsey Sauce. In the 2000s, they expanded their menu even further to include chicken sandwiches, Market Fresh sandwiches, corned beef, Angus steak, roast turkey, brisket, and other meats, until they really had them all. Today, there are over 3,000 Arby’s locations worldwide. What’s your favorite thing to eat at Arby’s? Had you ever guessed at the story behind its name? Let us know in the comments!